This children’s lesson is adaptable for Sunday School or Children’s Church services. It was prepared with a broad range of children in mind. The point of this lesson it to emphasize the truth that the Father once again spoke His approval for Jesus, His Son, and His desire for people to pay attention to what He says. Supply List: Pictures of Jesus on the mountain transfigured and talking with Moses and Elijah and/or pictures of the disciples seeing the cloud with God speaking to them. The Vanderbilt Divinity Library has a great collection of images that will work. 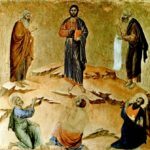 Learning Goal: When the lesson is over, the children will be able to express what the Lord wanted to teach Peter, James, and John when Jesus was transfigured before them about listening to Him. Learning Indicator: The children will retell the story with all the details and be able to relate the truth that God the Father still wants us to listen to the things Jesus tells us. Active Listening: Divide the children into three groups according to the gospel being read. Give each group the listening assignment of gathering as much information from their passage as they can find. Immediately after reading the gospel have that group give all the details they can remember and write their findings on the white/black board or poster board for each group. Help the children understand that 3 different men wrote each gospel and though told a little different, it doesn’t deteriorate from the truth of the passages. Details from Matthew 17:1-13: Jesus took Peter, James and John to a high mountain; transfigured Himself (which included His face shining like the sun and His garments white as light); Moses and Elijah appeared talking to Jesus; Peter said it was good for them to be there and wanted to build 3 tabernacles; God the Father came in bright cloud that overshadowed Jesus and spoke from the cloud that He was pleased with His Son and wanted them to listen to Him; disciples fell on their faces afraid; Jesus touched them and assured them not to be afraid and Moses and Elijah were gone; Jesus told them to tell no one about what they saw; they ask Jesus about those who say Elijah will come; Jesus says he will and will restore all things; says he already has come and disciples understood Jesus to be referring to John the Baptist. Detail from Mark 9:2-13: Jesus took Peter, James and John to a high mountain; transfigured Himself (described as His garment radiant and exceedingly white, whiter than anything on earth); Moses and Elijah appeared talking to Jesus; Peter said it was good for them to be there and wanted to build 3 tabernacles; God the Father came in bright cloud that overshadowed Jesus and spoke from the cloud that He was pleased with His Son and wanted them to listen to Him; Jesus told them to tell no one about what they saw; they ask Jesus about those who say Elijah will come; Jesus says he will and will restore all things and Jesus makes reference to the suffering and contempt he received an how they did what they wanted to him. Details from Luke 9: Jesus took Peter, James and John to a high mountain to pray; while praying Jesus’ face became different and His clothes became white and gleaming; Moses and Elijah appeared and were speaking to Jesus about His departure that was about to happen in Jerusalem; disciples had been asleep but awoke to see the two men talking to Jesus; Peter said it was good for them to be there and wanted to build 3 tabernacles; God the Father came in a cloud that overshadowed them and spoke from the cloud that Jesus was chosen One and that He wanted them to listen to Jesus; disciples became afraid at Father’s appearance; and then found themselves alone with Jesus; they told no one about what happened on the mountain. Open Discussion: Have the children describe what they believe was the reason Jesus took Peter, James, and John to the mountain with Him. Help the children see that the Father wanted them to recognize who Jesus truly was and to listen to Him. Test: Children retell the story: ask for several volunteers to help take all three accounts and retell the story. This incident with Jesus helps them understand that even though Jesus deserved worship, He didn’t want His disciples at this time building a permanent place of worship. The voice from God reminds the children that the Lord wants us to focus our worship on the person of Jesus. Discussion: Ask for volunteers to share why God the Father wants us to listen to Jesus. Help the children to understand that when God says, “No.” it’s because He always has our best in mind. Challenge them to choose one area that they will strive to listen to Jesus with this week. Tony Kummer (Editor) reviewed & updated this page on : February 27, 2019 at 6:53 am. All our content is peer reviewed by our readers, simply leave a comment on any post suggest an update.